However, in a conference call [Transcript 1, Transcript 2] with reporters, Facebook vice president of product Guy Rosen shared a few more details of the terrible breach, which is believed to be the most significant security blunder in Facebook's history. The first bug incorrectly offered users a video uploading option within certain posts that enables people to wish their friends 'Happy Birthday,' when accessed on "View As" page. Access Tokens "are the equivalent of digital keys that keep people logged in to Facebook, so they don't need to re-enter their password every time they use the app." 5.) Hackers Downloaded Users' Private Information Using Facebook API — Although it is not clear how many accounts and what personal information was accessed by hackers before Facebook detected the incident, the year-old vulnerabilities had left all your personal information, private messages, photos and videos wide open for hackers. "Since we’ve only just started our investigation, we have yet to determine whether these accounts were misused or any information accessed," the company said. 6.) Your "Logged in as Facebook" Accounts at 3rd-Party Apps/Websites Are At Risk — Since secret tokens enabled attackers to access accounts as the account holder themselves, it could have allowed them to access other third-party apps that were using Facebook login — a feature that lets you sign up for, and log in to, other online services using your Facebook credentials. You can head on to "Account Settings → Security and Login → Where You're Logged In" to review the list of devices and their location that have accessed your Facebook account. 9.) Breach Isn't Connected to the Hacker Who Pledged to Delete Zuckerberg's Personal Page — Earlier this week, a Taiwanese hacker, Chang Chi-Yuang, claimed that he would demonstrate a critical zero-day vulnerability in Facebook by broadcasting himself hacking Mark Zuckerberg's Facebook page on Sunday. 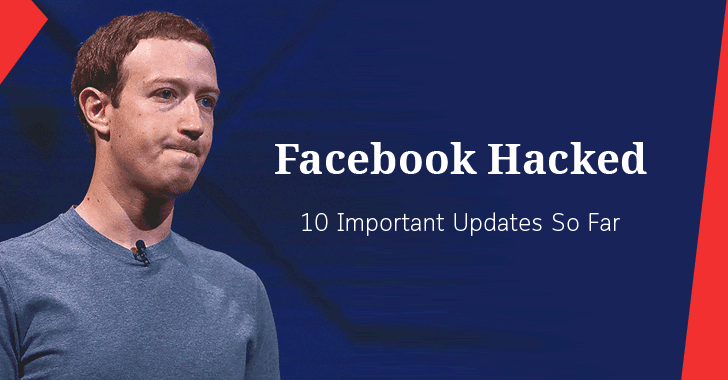 However, it is not clear whether the latest Facebook breach has anything to do with Chang's hack, at least Facebook does not believe so.